This issue's cover illustration is from Julia Donaldson and Axel Scheffler's A Squash and a Squeeze. Julia Donaldson is interviewed by Lindsey Fraser. Thanks to Macmillan Children's Books for their help with this May cover. Disney's choice of Pinocchio to succeed Snow-White in 1940 has sometimes caused surprise in Britain where, at that time, the story had no very high profile. In the USA however, within twenty years of its first translation (by Miss M A Murray: London, 1892 - not copyrighted), it was available in what Wunderlich and Morrissey call 'a plethora of titles' - a work recognized through-out the land as a well-loved classic. But that plethora was by no means pure Collodi all the way through (as I noted in a back-page piece in BfK 126 two years ago). Very early on abridgment and adaptation had set in with commercial chains and education boards bumping up the market potential and influencing the text. The present study of the burattino's fate at their hands is an exhaustive analysis of what the cats and foxes among publishers, stage-producers, and movie-makers have done with their victim. 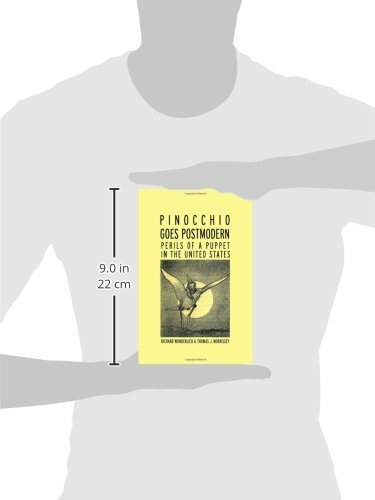 Foundation for the study is, on the one hand, Wunderlich's massive Pinocchio Catalogue of 1988 and, on the other, a detailed synopsis, largely drawn from secondary sources, of the social, economic, and educational history of the USA in the twentieth century. By matching the two chronologies the authors are able to demonstrate how Collodi's engmatic and often violent original has travelled to most of its readers in sanitised, sentimentalised, or even directly edited versions designed to put across messages suited to the 'cultural milieu' of the times. (We saw Jacqueline Rose note the same thing occurring with Peter Pan in one of the more comprehensible moments in her book on 'the case' of that hero.) 'Exhaustive' - if not 'exhausting' - is the word though. The enthusiasm of the authors for their task and their determination to squeeze every drop of evidence from their array of texts makes for something of a trudge through the bulk of the book, and I must question how far the specifics in their case, rather than its larger implications, will hold much interest for British readers. Our experience (if we have any) of both the published work and the social background differs fundamentally from that of the book's American audience - a factor which, when coupled with the crazy price, may well prove inhibiting to sales. If that is so, it will be a pity, for Wunderlich and Morrissey deal with their obsession in a straightforward way, and in their final two chapters they have things to say about the slippery nature of 'postmodernism' which are thought-provoking and could be applicable to a far wider spread of contemporary children's literature than Collodi's masterpiece. This book has been published as part of a lengthy, non-uniform series on 'Children's Literature and Culture', edited by Professor Jack Zipes. Fairly recent additions have been Retelling Stories, Framing Culture by John Stephens and Robyn McCallum (£55), an altogether more academic investigation of similar matters to those dealt with by Wunderlich and Morrissey. Also: a decently-researched attempt to discuss the multifarious elements in The Case of Peter Rabbit by Margaret Mackey (13.99), and a hefty book on How Picturebooks Work (45). You may have thought that you already knew about that and didn't need 300 pages of assistance, but you may have left out of account your grasp of things like Symmetrical Optatives and Visually Provoked Dubitatives. One of the book's two authors is Professor Maria Nikolajeva of Sweden.